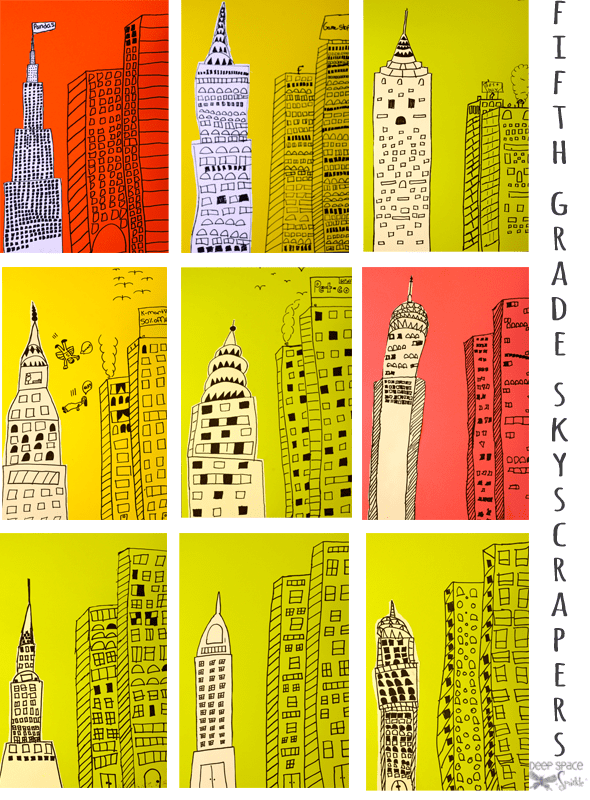 Inspired by illustrator, Marz Jr. 5th grade students looked at pictures of skyscrapers and created a retro line drawing of their observations. The students used a black Sharpie marker to draw the contour lines of a skyscraper (we looked at famous New York landmarks) and then got busy adding the dozens and dozens of extra windows and doors. 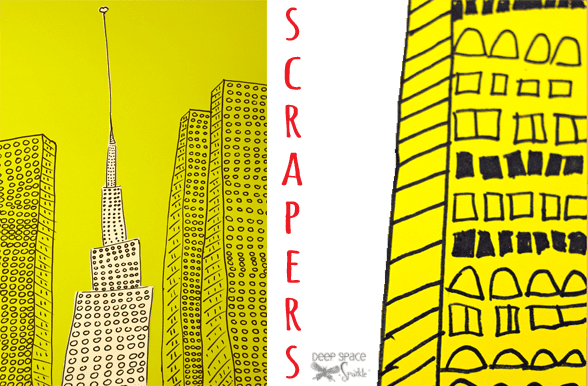 I suggested drawing 2-3 skyscrapers on the colored paper and leaving enough room for a 4th skyscraper somewhere on the paper. 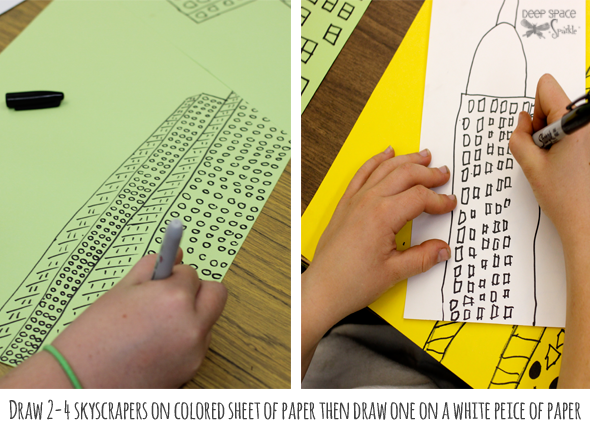 After drawing the skyscrapers on colored paper, I handed out sheets of 12″ x 9″ sulphite paper so the student could draw a final building. They cut the building from the white paper and glued to the colored paper. Stunning results! Teach art from a cart? Learn why this lesson is a great choice by downloading this free checklist and lesson guide! I love this! Simple materials, but hey look so sophisticated they could be pro illustrations! There is no time limit. I had 50 minutes but you could take as long as you like. A painted background would be very cool! Love this project! I needed a quick lesson for some pretty sophisticated 4th graders and this is perfect! Trying it in the morning! Thanks so much! Wow nice Line drawing… i like acent color.. Saw this site and loved the artwork. wondering if there were classes you offered? love the cut out here-what a difference that makes! These are so great, Patty! Could make a collaborative 3D version of them, Barbara Gilhooly style! Have a unit on built environments coming up… might just try that! Thanks, yet again! I did this lesson, as I mentioned above, with my talented 4th graders and one of them one a Silver medal at out regional art show! This is an amazing lesson with fabulous results! I did this but with the London skyline. Impressive results. Did you do any work with perspective before this lesson? Only as far as drawing a second side to a building. We mostly talked about skyscraper shapes and how to draw with lines. I love these! 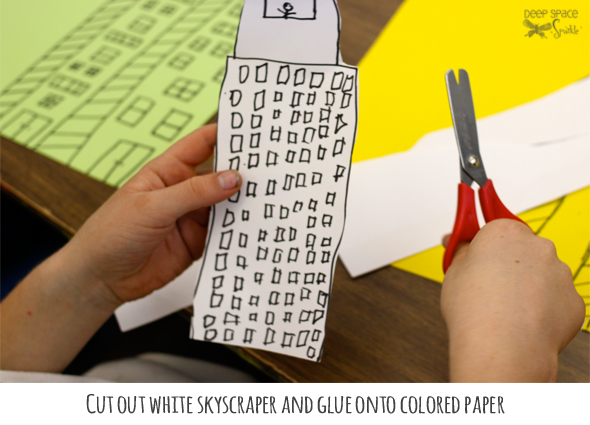 I want to try this with my fifth graders this week, but I am worried about how to teach them to draw the buildings. I like how your students seemed to use free lines. Do I just ban rulers? Yes, don’t use rulers. It prevents the student from moving freely throughout the project. Rulers would add rigidity to the skyscrapers but that would also be interesting. Two different projects. If you wanted to incorporate math into the lesson, I would use rules. If you want to create art, I would do without them! I love the idea of the skyscrapers! I was thinking of matching them with a creative writing project. A young boy has a summer and weekend job delivering lunches to peope who live and work in one of the buildings. He dare not open the brown paper bags with those lucious aromas, so he makes up stories about the tenant s and the food they’ve ordered. I would love to purchase a poster size print. Especially one from middle column, is this possible? I live in Kitchener On. Hi Lydia. I don’t make posters for me lesson plans but I love it that you think I should! Thanks for your question. i swant to purchase this art . Ehere do i find it. We don’t have a lesson plan for sale for this lesson. Sorry. Definitely check out our Shop for our lesson options. Feel free to reach out to support@deepspacesparkle.com if you have any questions.